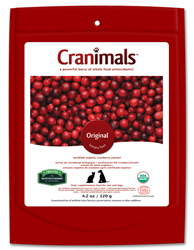 Cranimals Pet Supplements today announced that its Cranimals Original Urinary Tract pet supplement performed as well as a common antibiotic (cephalexin), in the prevention of canine Urinary Tract Infections (UTIs). Based on both clinical signs and laboratory urinanalysis, none of the dogs receiving Cranimals Original developed a UTI. An independent in vivo and in vitro veterinary study (1) in the American Journal of Veterinary Research this month compared Cranimals Original supplement to the antibiotic cephalexin to prevent infection by Escherichia Coli, the most common pathogen causing UTIs in pets. Based on both clinical signs and laboratory urinanalysis, none of the dogs receiving Cranimals Original developed a UTI. All dogs were expected to contract a UTI during the 6 month experimental period based on their medical histories. Cranimals Original significantly reduced the ability of E Coli to attach to canine kidney/uroepithelial cells, and this effect became more pronounced, the longer Cranimals Original was administered. There is general consensus that E Coli successfully infects the urinary tract of animals and humans by adhering to the uroepithelium, preventing it from being flushed out via urine flow, one of the bladders’ most important defenses. Urinary Tract Infections (UTIs) are common in cats and dogs, and pet UTIs are typically treated with antibiotics. This easily leads to the overuse and misuse of these antibiotic drugs. Pathogens like E Coli are rapidly becoming resistant to many antibiotics used in veterinary and human medicine. The transfer of these antibiotic resistant strains of E coli between animals and humans is concerning. Bacterial resistance also leads to unresolved or recurrent urinary tract infections; infection related complications (struvite stones, urinary blockage, renal damage), and increased economic costs (repeated treatments). The widespread use of natural therapies such as Cranimals Original, to help reduce antibiotic use is crucial to ensure conventional drug therapies remain effective. Cranimals Original has been used successfully by integrated veterinary care practitioners. This study adds further scientific validation for its use in conventional veterinary practice, and substantiates Cranimals as the world leader in natural urinary tract remedies for dogs, puppies and cats. Cranimals Pet Supplements is a privately owned, Canadian company, based in Vancouver, BC and manufactures a variety of cat and dog supplements, and distributes diagnostic tests used by consumers to diagnose UTIs, diabetes and kidney failure at home. For a copy of the study please contact Cranimals. Cranimals and the Cranimals logo are registered global Trademarks. 1. Chou et al. American Journal of Veterinary Research. 2016: 77 (4) 421-427.